After posting my series on Post-PC development, I was contacted by several vendors who have already made the leap into the on-tablet application development space in a big way. One of these companies is Byteworks, the developers behind the recently released techBASIC for the iPad. techBASIC is one of the few interpreted coding environments available on the iOS platform that executes scripted code on the fly. This ability is a somewhat exclusive achievement given Apple's strict constraints on running interpreters on their mobile platform. Because of these Apple-imposed restrictions, techBASIC is currently limited to a sandbox that only executes rudimentary instructions in the usual file system sandbox offered to all except Apple's own software. techBASIC also only has access to rudimentary on-board iPhone and iPad sensor information, such as the accelerometer and magnetometer readings. techBASIC currently does not have access to more desirable hardware features like access to the camera or networking capability. techBASIC script variables can be watched, and code can be easily debugged via the Step In/Out/Over features. To make up for these shortcomings, Byteworks introduced the option to use the HiJack analog to digital converter to display real-time data captured from the sensors attached to the HiJack hardware. Byteworks partner in this recent HiJack feature edition, Seeed Studios, is the official vendor of HiJack hardware. Seeed Studios bills themselves as an Open Hardware Facilitator, and sells the HiJack hardware that plugs into the iPhone or iPad's audio port. Once connected, custom HiJack classes in techBASIC can be used to access the digital data captured by the HiJack hardware. 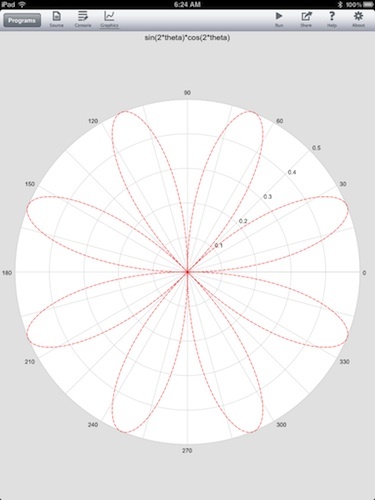 The captured data can then be graphically displayed on screen using simple routines called by techBASIC code. Using this approach, techBASIC programmers can create a number of interesting real-time graphs. Some examples include a simple oscilliscope, a three-lead EKG, a temperature hisotry graph and a humidity sensor. HiJack hardware values can be accessed via techBASIC's HiJack class. Seeed Studios is expected to expand their line of HiJack-compliant hardware to further take advantage of data collection programs like the kind of facility that techBASIC provides. In the meantime, students, teachers, engineers and scientists can create some pretty nifty real-time programs with an iPhone or iPad, a HiJack plug and techBASIC. Having created a few of my own HiJack-enabled techBASIC apps completely on the iPad (with the help of a Logitech Tablet Keyboard to type in and debug the techBASIC code), I found the process to be fast, simple and rewarding. Considering the amount of time and Objective-C knowledge required to write a native iOS app that captures and displays the HiJack data, the techBASIC approach is definitely preferred. The resulting graphic output of a techBASIC script. techBASIC is currently available in the Apple App Store for $14.99. The Seeed Studios HiJack audio plug can be purchased online from the Seeed Studios website for $79. For more information about techBASIC, visit the Byteworks website. 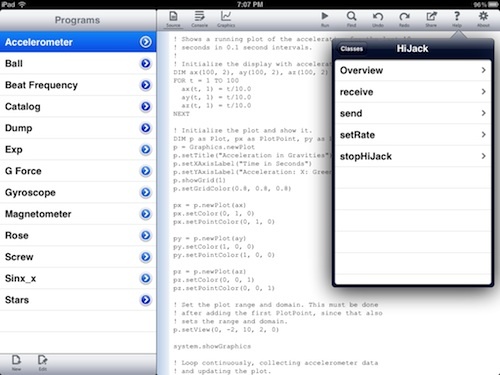 More specific details about using HiJack sensors with techBASIC can also be found on the site. For more details about Seeed Studios' HiJack Development Pack, visit their online store.